What would be the best advice for someone who now starts to ride a Halfbike? | Halfbike | The compact and light standing bike, anywhere with you! What would be the best advice for someone who now starts to ride a Halfbike? Look ahead, try to ride in a straight line and keep practicing! It may not sound like much but it's the best single piece of advice that I can give to a newbie. Form then on everyone has to find his balance and what it takes for him to improve. For my first ride, I found a fairly flat road (not crowned) that sloped slightly downhill. I put one pedal down, put my weight on that pedal and gently pushed off with the other foot, and just coasted - without pedaling. I then walked back up the hill and coasted down again. After I got my balance, I moved the handlebar to make small changes of direction. 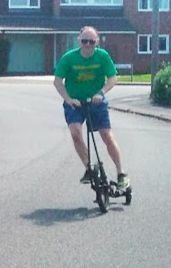 Next, I pedaled while coasting, just to practice balancing, not to propel the bike. Finally, I practiced in a large, empty parking lot, pedaling and making wide turns. A running track with a rubberized surface is a great place to practice. You can pick up speed on the straightaways, pedal on the wide turns, and if you fall, the surface is fairly forgiving. Go straight on a flat surface (Away from vehicles, such as a child's park) and don't try and turn initially. Keep you head up pointing to the road ahead and don't look down. Watch out for the turning bar, if you lean on it you will turn and fall off. Understand how the bike turns. Put your right foot on the right tyre and press down hard. Now use your left hand and lean the handlebar over to the left. Keep the right foot on the tyre fixed and see how the bike leans with the spring. Repeat with the left foot and the right hand. Now you can understand how this product turns. My halfbike arrived just as the air quality in Northern California plummeted into the hazardous range from the recent wildfires - too unhealthy to ride outside. Nothing left to do but practice standing on the unmoving bike in the living room, get used to shifting/recovering my balance, and then pedaling backwards in place. Did this several times across the almost two weeks of bad air, then this weekend, took it outside for the first time and was able to ride pretty much right away. Still lots of practice to go, but the standing on the pedals and backpedaling on the stationary bike definitely helped. Relax, look ahead, try to ride in a straight line. Don't stop 'till you get it and keep on practicing. And the best part is ENJOY !